Confession: my chocolate addiction is getting out of control. The long, cold nights of winter (and the few hours of daylight) have made it worse. My problem is in the evenings after dinner: I seem to have developed an addiction to sugary sweets after dark. A small treat once in a while is all well and good. But sweets everyday? I’ve been thinking I need to come up with a healthier alternative. I found the answer in a fantastic suggestion at the food blog spoon fork bacon. 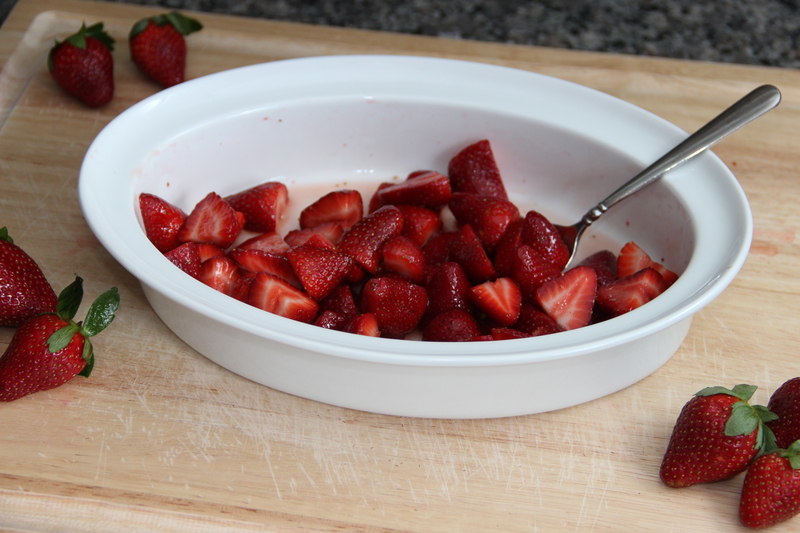 The idea is to enhance the mouthwatering sweetness of strawberries by roasting them in the oven. Suddenly, a healthy snack is transformed into a unique and decadent treat. Genius! 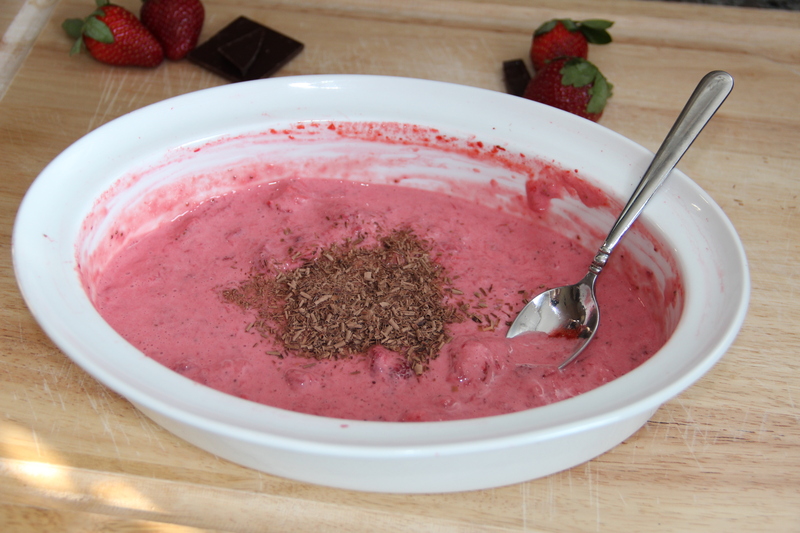 This gave me so many recipe ideas, and here is my favorite: a fruit dip made with roasted strawberries and greek yogurt and topped with dark chocolate shavings. 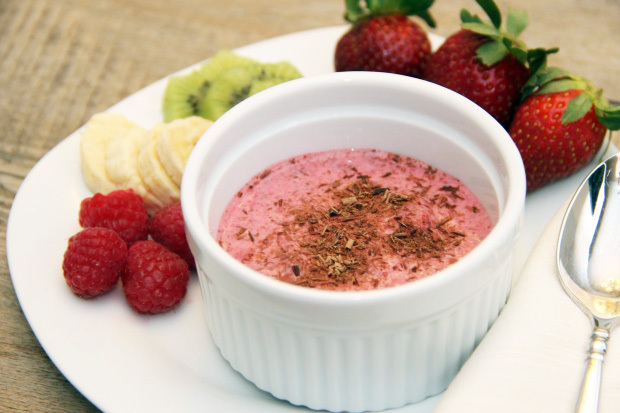 I love this dish for a few reasons: 1) greek yogurt and fruit (and even dark chocolate) are full of healthy nutrients, so it’s snack you can feel good about eating and 2) this dip tastes rich and flavorful, so you can trick your brain into thinking you’re getting an indulgent treat. Start by preparing the strawberries. Strawberries are an amazingly healthy snack choice. They have tons of Vitamin C and they’re full of flavonoids, which are antioxidants shown to block and inhibit cancer cells. 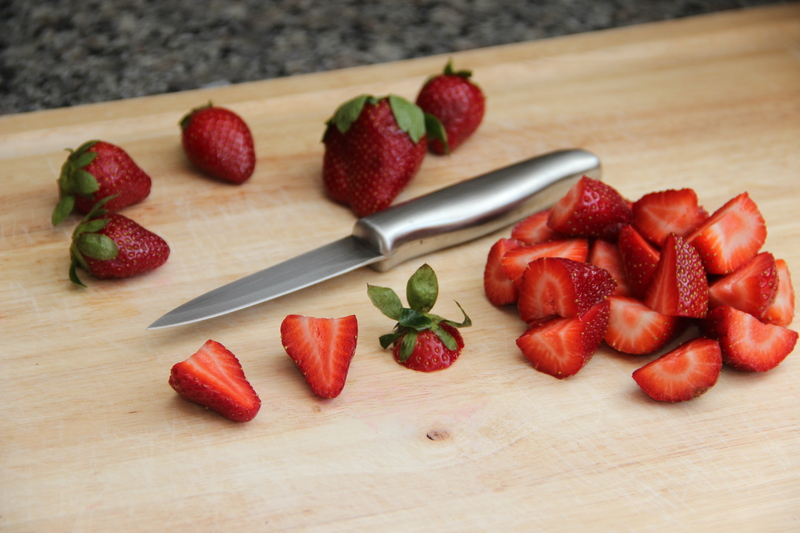 Begin by removing the stems from the strawberries and slicing each berry in half. Place the berries into a large mixing bowl and add the agave nectar and vanilla extract. Stir to combine the ingredients. 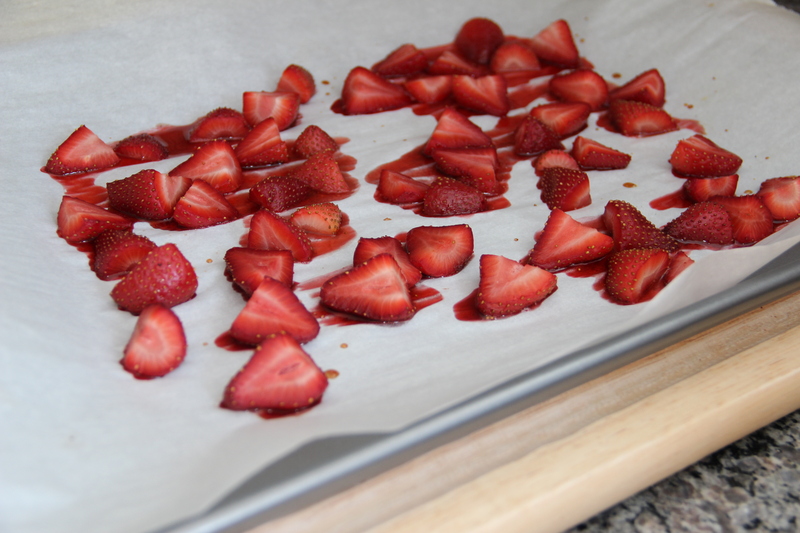 Spread the berries out across a parchment-lined baking sheet. Roast the berries in the oven for about 18 minutes. Remove just as they’ve softened and begun to release their juices. Delicious, concentrated berry flavor! 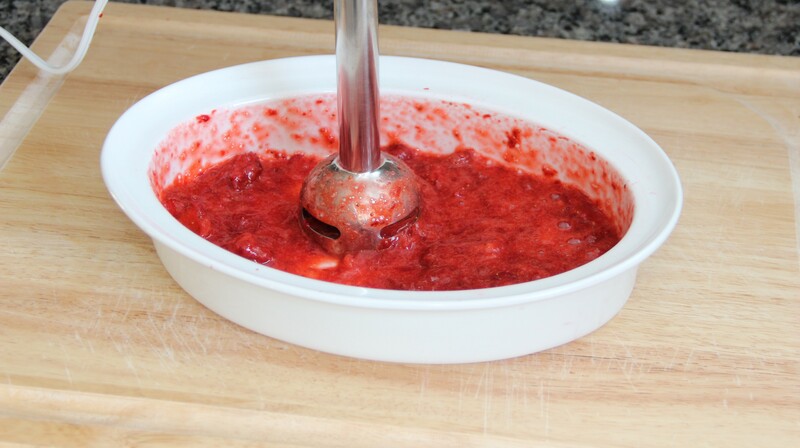 Allow the berries to cool to room temperature, then place them in a mixing bowl and puree them using an immersion blender. A food processor or blender would work as well. I add just enough yogurt to add some creaminess. 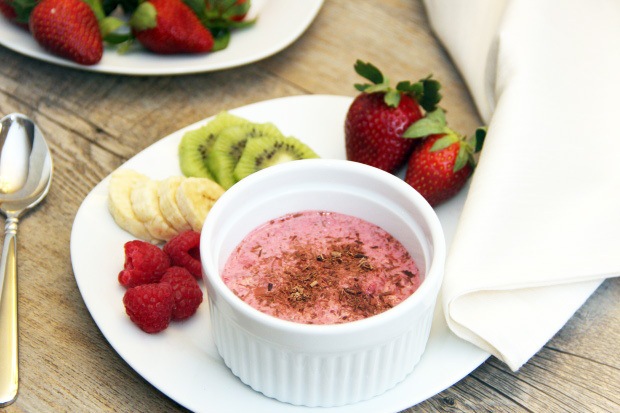 I prefer that the dip is made primarily of the roasted strawberries so it remains a bright, vivid pink color. Next up: the chocolate! We’ve all heard the news about how dark chocolate is full of antioxidants that help protect our bodies from heart disease and cancer. Two big things: 1) the best source of antioxidants is dark chocolate (as opposed to the more processed and sugary milk chocolate or white chocolate) and 2) moderation is key! So I use just a couple tablespoons in this recipe so there’s a chocolatey taste in each bite without going overboard. Use a vegetable peeler to scrape some dark chocolate shavings from 1 or 2 (1 1/2-inch) squares of dark chocolate. Add the chocolate to the bowl and stir to combine all the ingredients. Serve the dip chilled. This is good for you, but it feels like an indulgent treat. Now the best part: taste-test a variety of fruits for dipping and find your favorite. I found that the following tasted especially delicious with the dip: strawberries (duh), bananas, pineapple, and raspberries. Discover your own favorites and let me know what delicious combos you come up with! And enjoy! Variety of fruit for dipping: bananas, strawberries, raspberries, pineapple, etc. 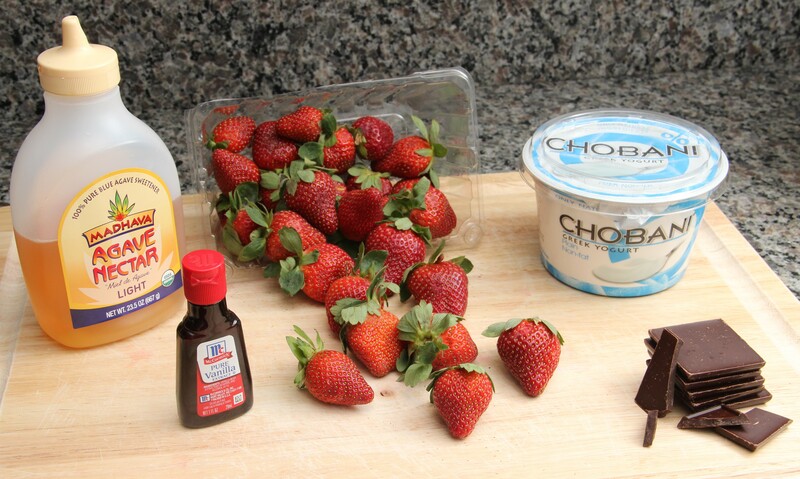 Remove the stems from the strawberries and cut the berries in half. Place the berries in a large mixing bowl and add the agave and vanilla extract. Stir until well-combined. 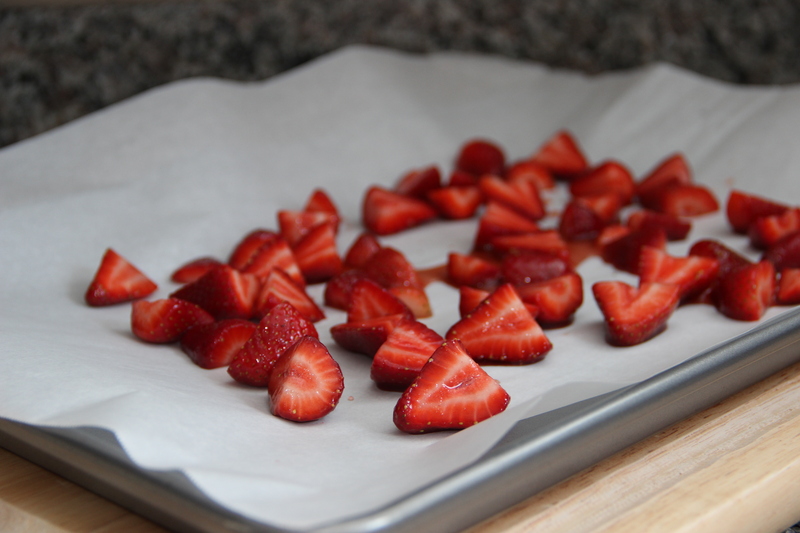 Arrange the berries on a baking sheet lined with parchment paper. Roast for about 18 minutes, or just until the berries soften and begin to release their juices. Place the berries in a large mixing bowl and puree using an immersion hand blender (or blend using a food processor or blender). Strain any excess liquid from the greek yogurt and add to the puree, stirring to combine. Using a vegetable peeler, sprinkle dark chocolate shavings over the dip. Stir to combine all ingredients. Transfer dip to a serving bowl and serve chilled. Looks delicious. I’ve never roasted strawberries – but I think I’ve been missing out! I understand your sweets conundrum. I’m definitely in the same boat! This looks absolutely delicious though. Thanks for posting! Oh. My. This is GENIUS! I tried making my own white chocolate dip for making chocolate covered strawberries. It didn’t work so well, as it kept sliding off the fruit. Then again, I was purely improvising without a recipe. Does Greek yogurt taste funky compared to regular yogurt? If you like regular yogurt, I’m sure you’ll like Greek yogurt too. It tastes basically the same, but it’s richer and thicker. And it has more protein so it’s more filling as well. This I really like … !!!! Never heard about roasted strawberries … but I have eaten fresh strawberries with green pepper – very good. This I will try on the girlfriends. Fruit is never wrong with the ladies. This sounds so sinful, I have go out and by my strawberries right now! My favorite foods! Chocolate, Greek yogurt and strawberries! yum! Awesome idea – will have to try out as soon as we get strawberries around here again! I can’t wait to try this one with our 8 grand kids. We all love chocolate and strawberries and I am addicted to Greek yogurt!